Q: I tried to open a WebCall account, but it didn’t work for me. That’s when I found out I could already use the click-to-call features and buttons on my existing plan. Are they the same? A: Yes. Click to Call is the name of the feature which allows you to post links on your website and in e-mail to allow callers to call you toll free. 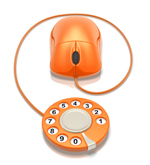 WebCall is a Halloo service plan which gives you Click-to-Call and voicemail, but does NOT include a telephone number. So you can sign up for WebCall to make calls out, and to receive calls via the web, but in order to receive calls from people who dial you directly, you would upgrade to a Halloo Solo plan, which gives you a Toll Free number. Click to Call is a standard feature of all Halloo plans: WebCall, Solo, Office, Business VoIP, and FlexCall Center. This entry was posted in Click to Call, Halloo Hints and tagged Click-to-Call, WebCall by Kimm Antell. Bookmark the permalink.